Easily add your code anywhere on your Wordpress page. Right to the place of the block. No output, other than your code. Optimized and fast server side implementation. Find Custom JS/CSS block on the Gutenberg blocks and add it to the page. Click on Min button to minify the output. Select JS or Babel options. When JS is selected, the script will be printed as is. When Babel is selected, the script will be converted to ES2015. Easily add your custom CSS code to the page. Write in SASS or LESS and it will be converted to CSS on the fly. 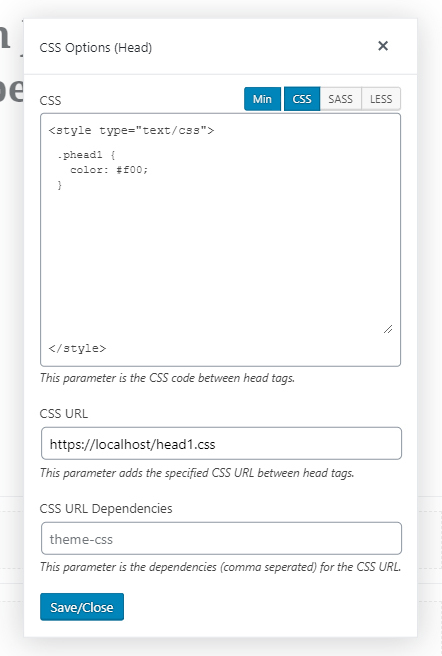 Easily add custom CSS files to the page, including specified dependencies. The specified CSS code is placed where the block is at the output. Write your code inside the CSS (Inline) text box. Select CSS / SASS / LESS options. When CSS is selected, the code will be printed as is. When SASS is selected, the SASS code will be converted to CSS. When LESS is selected, the LESS code will be converted to CSS. The specified CSS code is placed between <head> and </head> tags. Enable Enable Head CSS option. Click on CSS Options (Head) button to see the options. There will be a modal window. Enter your CSS code if you. The specified CSS code will be placed between <head> and </head> tags. Leave empty if no code is required. Enter your CSS file URL. The specified URL will be placed between <head> and </head> tags. Leave empty if no file is required. Enter your CSS file dependencies (comma seperated). The CSS file URL will be enqueued according to the specified dependencies. Leave empty if no dependency is required. The specified CSS code is placed right before closing </body> tag. Enable Enable Footer CSS option. Click on CSS Options (Footer) button to see the options. There will be a modal window. Enter your CSS code if you. The specified CSS code will be placed before closing </body> tag. Leave empty if no code is required. Enter your CSS file URL. The specified URL will be placed before closing </body> tag. Leave empty if no file is required. 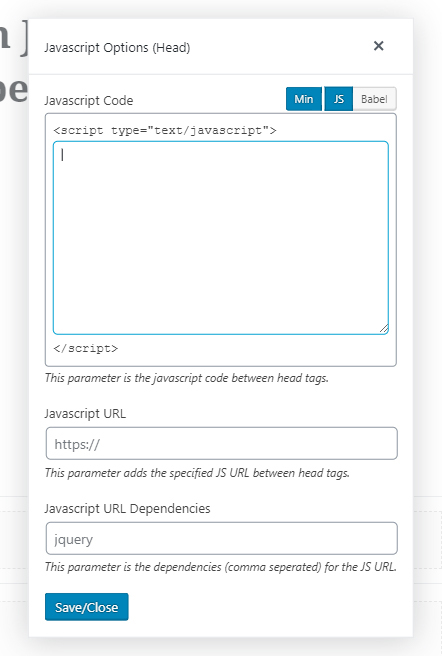 Easily add your meta tags to the page. The specified meta tag is placed between <head> and </head> tags. 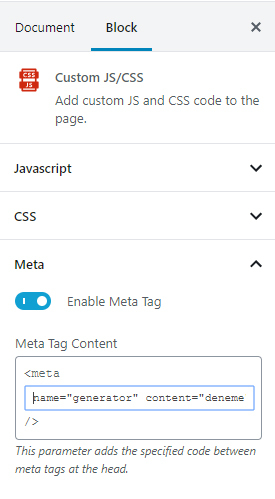 Enable Meta Tag Content option. Write your meta tag content inside the Meta Tag Content text box.